Around this time of the year, especially if you partake in the Halloween festivities, you will find yourself inundated with candy and other sweet treats and bakes. In a nutshell, a sugar overload. While I love my cakes and sweets / candy as much as the next guy or gal, if you are like me, you will need a little bit of savory to cut through all that sweetness. Last year, I was really excited about Halloween. We were supposed to have a big Halloween party at my workplace. However, as luck would have it I quit that job in early October to focus on building up a little business. When my colleagues threw me a small farewell party, they decided to roll with the Halloween theme. I couldn't pass up on the opportunity to whip up a few treats. These little cracker bites were one of them. I will share the rest of them with you over the next few days. My job was extremely physically demanding and boasted quite a few really long days. So I had to come up with treats that were quick and easy to put together. I knew the candy part of the party would be taken care of, so I stuck with the savories. 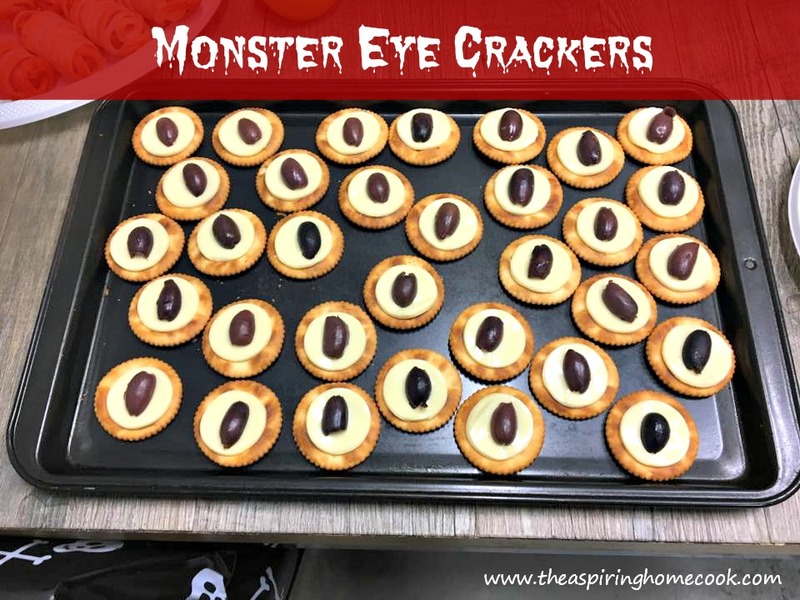 These Monster Eye crackers are perfect for a party or get together. They are a Halloween Play on cheese and crackers. They can be whipped up really quickly with all of 3 ingredients. So, I knew I was going to make them. I was a little skeptical about them considering how simple they are, but let me tell you, they vanished really quickly. I wish I had made more. If you decide on making these, make sure you make a big batch. 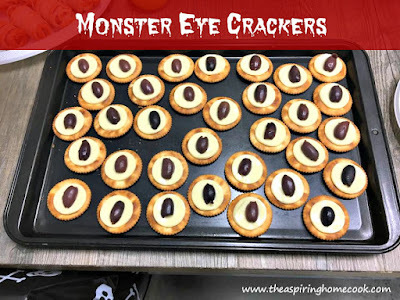 So to make these, all you need are crackers. I love the Eton crackers found in Aldi stores locally, but if you cannot get your hands on them, Ritz Crackers will work just as well. You can use any other crackers you'd like. Now that the crackers are sorted, the next ingredient is the cheese. I used Kraft Cheese Slices , but again, you can use any cheese slices you like. The last ingredient you need are olives. You can use Pitted Kalamata olives or pitted Green olives, if you prefer. The process is fairly simply, and works fastest if you create an assemble line. I hope you enjoy these little snacks this Halloween as much as we did. You will also need a circle cookie cutter, just a little smaller than the size of the crackers you choose to use. Cut the cheese slices into circles using the cookie cutter and keep aside. Cut the pitted olives in half and keep aside. On a serving platter, place the crackers in a single layer. Top the crackers with a circle of cheese and top that with half an olive. And that's basically it. Serve up.